This is an excerpt of an email that I sent to a few friends back home while shooting the Mayan Caves in Belize. Shoot on my feet all day; climb walls & rocks, crawl through little holes to new chambers, endless. This has been repeated each day since my arrival. So 10 pounds gone was a piece of cake! Our team consists of 8 gringos and 1 local Mayan rancher who knows the jungle and the caves like the back of his hand. There are 2 teams inside the cave: 3-4 people on my photographic team, and the rest of our crew make up the Archaeological Geo Mapping team. The caves are truly magnificent! The natural formations are amazing works of Nature’s artistry combined with the mystique of Mayan Rituals. The Mayans have left behind some beautiful artifacts that are helping the Archeologists to put together the pieces of their ancient lives. None of these caves were ever inhabited. They were all used exclusively for ritualistic purposes. This might include: smoking ceremonies, prayers to the gods of food, sun, sky, and rain. Sometimes these rituals might include sacrifices of personal jewelry, food items, small animals, and periodically, people. The biggest challenge for me has been how to light the caves. As soon as you get past the entrance, you are in a pitch black that quickly absorbs what little light that comes from your helmets. 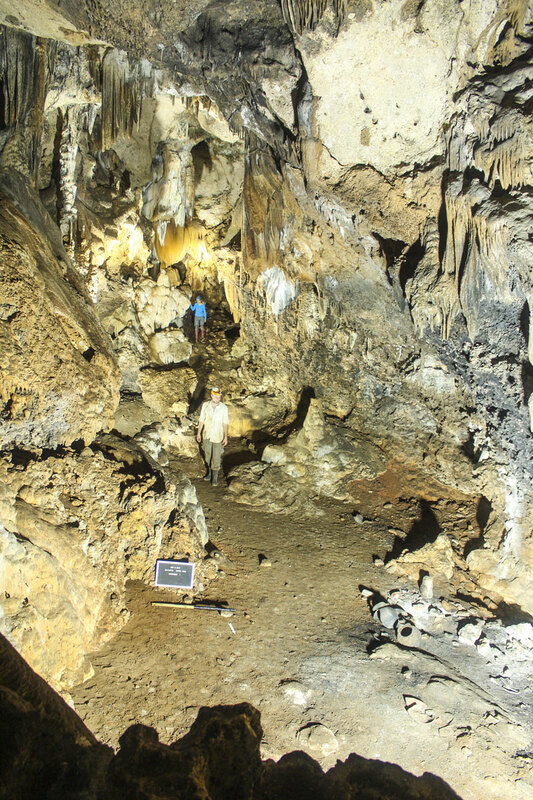 We lugged 4 12″ x 16″ lights to each section of the cave to provide the main light for the photos. I then had to determine the 3-dimensional size of the chamber that I was going to shoot, then calculate the length of time to keep my shutter open. Since some of the chambers were pretty huge, we had to utilize a technique called ‘light painting“. This means that while the lens is open, we would each ‘paint’ light (using our headlamps) all around the dark area so that the camera would pick up light from those areas. This was an interesting way to compensate for the fact that we were under-gunned in the Lights department. Each chamber presented its own challenges – photographically speaking – and it was up to me to invent a new technique to solve each challenge. But one by one, we conquered the issues and were able to move through the caves to completion. One cave is about 200 meters long, and I was able to complete it in 5 days. The second cave was much smaller, and extremely cool! As soon as you entered the cave, you had to immediately climb down a 20-foot ladder to the first chamber. There was a nice selection of perfect ancient pots, plates and other vessels here. Then down another 15-foot ladder. More pottery. Then down another then another. There were 6 small chambers in this cave that went down into the bowels of the earth. But because the chambers were so small, lighting them presented much less of challenge, and I was able to shoot that cave in 1 day. The rest of the days were the days that we were not able to make it to work because on one day, we blew out the 4wd on one of our trucks. The next day, we proceeded, all piled into 1 vehicle, and because of the rain, we flattened a tire and got stuck so badly that Dr. Moyes decided that we were going to have another lab day at the Dig House instead of proceeding to the caves. For me, a lab day consists of shooting artifacts (hundreds of them) for cataloging. Today, no jungle, no caves. A really nice simple lab day shooting artifacts in front of a breezy window. NICE! Note: I have to thank the great group of fine folks that made up the entire team. They are hardy and good-natured, and are great sports for ‘dragging their mother along’ on this expedition. (In case you’re wondering, I’m the mother.) These folks are half my age with an excellent work ethic and terrific senses of humor. I would be honored to work with them any time in the future.